Located on the legendary Sunset Strip, Andaz is in close proximity to Beverly Hills, Downtown Los Angeles, Hollywood, and some of Southern California’s most legendary beaches. Andaz West Hollywood offers a friendly and personalized approach to service. It gives you the insider's tips, tours, and guides to anything your heart desires on the 'strip' and beyond. Enjoy the spectacular views of L.A., high above the cruise of the Sunset Strip along the famed Hollywood Hills, on a rooftop sundeck. Make memories within 13,000 square feet of meeting and event space at Andaz West Hollywood. Our unique venues are ideal for executive gatherings, meetings, weddings, and events in West Hollywood. Celebrate in our rooftop ballroom with sweeping views of Los Angeles, meet your team in one of our studios, or gather in the Wine Gallery. Our talented culinary team will put together a customized menu, and our Andaz event managers will ensure every detail is exactly what you envisioned. 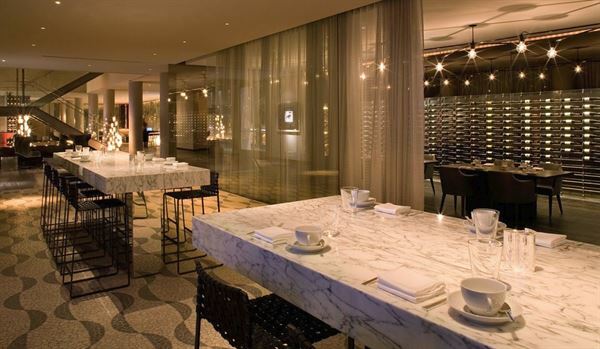 Enjoy elegant surroundings and spectacular cuisine when you dine at Hyatt West Hollywood's indoor/outdoor restaurant. Discover the intimate fire pit while you indulge your palate with decadent cocktails. Or just relax at the hot red-leather bar and mingle with Hollywood's A-list crowd. Enjoy a swanky dinner event for up to 150 or a chic wedding reception for up to 300 in the Panorama Ballroom on our rooftop, overlooking the Sunset Strip and Downtown Los Angeles to the beaches. The gorgeous 2,700 square foot ballroom is connected to The Sundeck, which provides a beautiful outdoor space for a romantic evening wedding above LosAngeles. Fantastic modern hotel with a roof top bar and pool with amazing views of LA. Very welcoming staff, complimentary snacks in the mini bar. Food in hotel restaurant is nice but over priced, try mel's place nearby for food. Great for guest out of town. I wanted to have my wedding reception outside. It was very difficult to find venues that offered outside space with the class that I was looking for. Fortunately, my best friend recommended the Andaz Hotel on the Sunset Strip. Not only is it a stunning location, but the Ivy Rooftop is absolutely pristine. The space is overlooking the city lights and provides for an unbelievable view. The rooftop is well lit and there are many plants throughout the space to enhance its outdoor qualities. The dim lighting on the rooftop makes for a very romantic ambiance that is unbeatable. I found the rooftop to be appropriate for small parties, which was excellent for my reception. Inside the hotel was chic. The decor is modern, but classy. I found that the colors were rich and gave the hotel an excellent vibe. The food was excellent, as the hotel's chef uses fresh and local produce to make delicious dishes. There is a dining space inside the hotel and I was in awe by the beauty of the tables. The wood is a beautiful blend of different color browns and it creates an amazing atmosphere. I was extremely happy at this venue. The staff were great and were very willing to help with all of my questions and nervousness before the party. The space was terrific for my reception and the hotel rooms were great for all of the guests to stay in after the reception. I highly recommend it to others who are looking for a similar space.